The helping hands and giving hearts of Samford University students were evident throughout the Birmingham area Saturday, April 16, as many, along with employees and alumni, participated in Samford Gives Back Day. The volunteers spread out north, south, east and west to spend the morning working at about 38 sites. The effort, with a “Love Your Neighbor” theme, was sponsored by Samford’s Frances Marlin Mann Center for Ethics and Leadership. Allen, a senior business major from Madison, Alabama, helped welcome the volunteers at a gathering in Seibert Stadium before everyone departed for work sites. Workers included members of service organizations, sororities, fraternities, academic societies and teams of individuals who banded together to give back in ways that used their skill sets and interests. About 15 students, calling themselves the “Dream Team,” worked with residents at South Haven, a rehabilitation center for individuals suffering from memory loss. Organized by Courtney Carroll, a freshman education major form Alpharetta, Georgia, the group played games, worked puzzles, made crafts and chatted with residents. Shea Summerlin, a 2015 Samford graduate and first-year student in Samford’s McWhorter School of Pharmacy, was among the volunteers. Meanwhile, the “Trailblazers” worked on an outdoor classroom at Trace Crossings Elementary School in Hoover. Lauren Hughes, a junior education major from Fultondale, Alabama, organized the group as part of her ongoing work at the school during the fall semester. 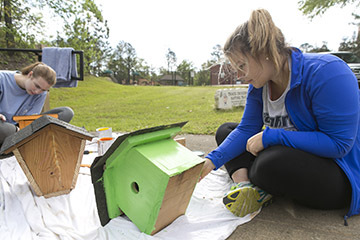 On Saturday, the Samford students painted and installed birdhouses, and added stepping stones and information charts to help make the area an official Google outdoor classroom. The result of their work should provide “an interesting learning experience” for Trace Crossings students, Hughes said. Samford’s Latino Student Organization helped the Hispanic Interest Coalition of Alabama (HICA) move offices from one part of its building to another. Fernanda Herrera, a junior international relations major from Ohatchee, Alabama, appreciates the passion that Samford students have for helping the community. “It’s great that we sit in classrooms and talk about the importance of Christ and love for each other, but really implementing that and putting that into action on a Saturday is awesome,” Herrera said. Phi Mu sorority members and friends traveled to a west Birmingham suburb to work at Grace House, a women’s and girl’s ministry in Fairfield. The project appealed to senior Katie Hill because her academic department, human development and family science, has a relationship with the ministry. “The work that Grace House does is astonishing and really shows God’s grace and love,” said Hill, who is from Thompsons Station, Tennessee. Samford Gives Back helps teach what it means to be a servant, she said. “It’s a great way to learn more about your skills and about how you fit in serving in the community, whether it’s manual work or relational work,” Hill said. In Homewood, members of Samford’s DiversABILITY organization gathered at Raleigh Avenue Baptist Church to help Rooftop Friends disability ministry assemble goodie bags that will be distributed at a retreat for families affected by disability. Members of Phi Mu sorority and Pi Kappa Phi fraternity did garden work and painted wall murals at East Lake United Methodist Church and East Lake Ministries. Samford Panhellenic women helped paint a gym where Girls Incorporated of Central Alabama holds an after school program for girls. They also scraped picnic tables to be refurbished and worked in a garden where girls learn how to grow vegetables that they will learn to cook. Panhellenic President Garrison Rutledge notes that seeing the team effort of multiple sororities is rewarding. “Having this shared experience will hopefully bring us all closer together,” said Rutledge, a junior political science major from Uvalde, Texas. Restoring Eden environmental group partnered with Friends of Shades Creek to pick up trash along the creek that runs in front of the Samford campus. Sarah Jessie, a sophomore journalism and mass communication major from Coppell, Texas, said that the project is good for the environment and good for Samford students in general. “It allows the community to see that Samford students really care,” Jessie said. Not far from that project, Samford’s International Club members cleaned the grounds at Lakeshore Foundation. Workers representing Sigma Chi fraternity, Gamma Sigma Sigma service sorority, and groups dubbed as the Fantastic Five and Independent Students helped with the annual Old Howard 100 Bike Ride, which registered 403 riders. The annual benefit to support Sowing Seeds of Hope service ministry in Perry County begins and ends in Marion, Alabama, where Samford was founded in 1841. The Samford Alumni Association coordinated volunteers to serve at Arc of Jefferson County, which serves more than 700 people with intellectual disabilities. The graduates worked on exterior landscaping at an Arc residence. Sarah Ficke, a 2011 Samford alumna, was among those picking up trash, laying mulch and pulling weeds. “The day was a living example of the challenge of Christ to love our neighbors. The world is better because Samford people understand that life is empty without serving others,” Westmoreland said. Note: Aly Hathcock, student news and feature writer, Division of Marketing and Communication; Allison Kanne, communication intern, Mann Center for Ethics and Leadership; Philip Poole, executive director of university communication; and Sarah Waller, coordinator of marketing and communication, Office of Alumni Programs and Annual Giving, contributed significantly to this story.